For every deployment of Microsoft Dynamics NAV 2018 you must install the core components, which are the three tiers that make up the Dynamics NAV architecture. The RoleTailored client is the client tier, which includes a Microsoft Dynamics NAV Windows client and a Microsoft Dynamics NAV Web client. In addition to the RoleTailored client, Microsoft Dynamics NAV 2018 also supports additional client types, including web service clients and a NAS services client for programmatic access. For details on the various client types, see Client Types. SQL Server, augmented by Microsoft Dynamics NAV 2018 database components, is the data tier. If you deploy Dynamics NAV in a multitenant deployment architecture, the data tier consists of an application database and one or more tenant databases. When you install Microsoft Dynamics NAV 2018, all components must be from the same version and build of Dynamics NAV for the software to run correctly. You can have multiple instances of any of the core components in a production environment. 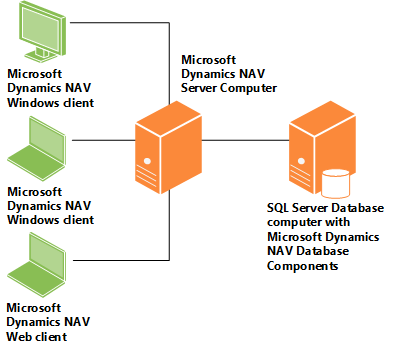 The following diagram shows a simple installation with two Microsoft Dynamics NAV Windows clients and a Microsoft Dynamics NAV Web client connecting to a single Microsoft Dynamics NAV Server computer, which in turn connects to a computer with SQL Server and the Dynamics NAV database components. All three components on the same computer. This is the configuration for a demo install, and is also typical for a development environment, so that a developer can work on Dynamics NAV applications without worrying about network connections and inter-component security. See Walkthrough: Installing the Demo Version. RoleTailored client and Microsoft Dynamics NAV Server on the same computer, data tier on a separate computer. This scenario is described in Walkthrough: Installing the Three Tiers On Two Computers. Each of the three tiers on a separate computer. This scenario is described in Walkthrough: Installing the Three Tiers on Three Computers. In addition to the three core components, there are additional components that enhance or supplement the core components. Microsoft Dynamics NAV Help Server A website with the Help content for Dynamics NAV in the languages that your version of Dynamics NAV includes. You can deploy a single Help Server for all users, or customer-specific Help Servers, depending on your requirements. Web Server Components. See How to: Install the Web Server Components. The components that are needed to enable Microsoft Dynamics NAV Web clients to connect with a browser. Microsoft Dynamics NAV Server Administration Tool A tool for configuring and managing Microsoft Dynamics NAV Server and Dynamics NAV sites. Development Environment (C/SIDE) The Development Environment for creating and modifying Dynamics NAV applications in C/AL. Microsoft Office Outlook Add-In A component for synchronizing data, such as to-dos, contacts, and tasks, between Dynamics NAV and Outlook. Automated Data Capture System A Dynamics NAV tool for accurately capturing data for inbound, outbound, and internal documents, primarily in connection with warehouse activities. With ADCS, company employees use handheld devices and radio frequency technology to continuously validate warehouse inventories. ClickOnce Installer Tools. See Deploying Microsoft Dynamics NAV Using ClickOnce. A set of tools designed to create ClickOnce deployments for applications for the Microsoft Dynamics NAV Windows client.